This note outlines the procedure followed to upgrade GoldenGate 12.3 to the latest 18c version (18.1.0.0.0). In this example, the source database version is higher than 11.2.0.4 and we are using Integrated Extract where DDL capture support is integrated into the database logmining server. Issue the command SEND REPLICAT with the STATUS option until it returns a status of “At EOF” to indicate that it finished processing all of the data in the trail file. 0 records in current transaction. GGSCI (rac01.localdomain) 7> stop mgr ! 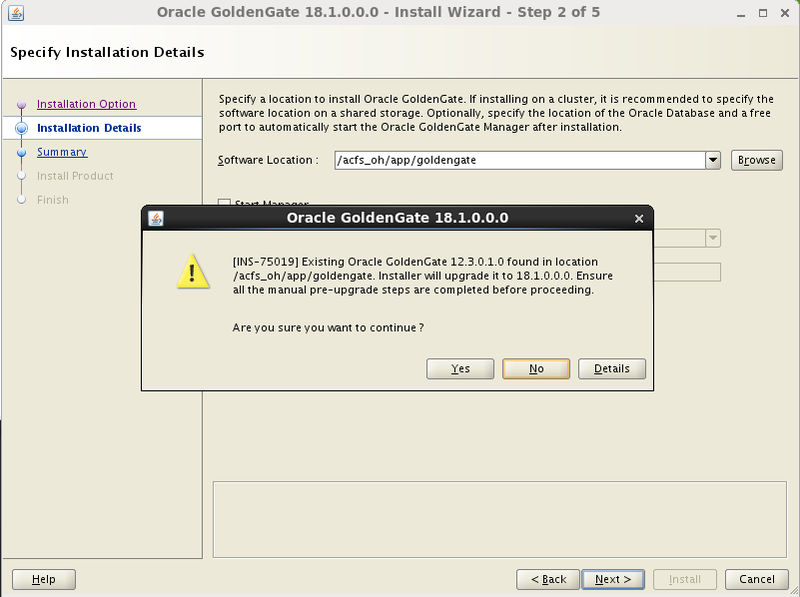 Take a backup of the current Oracle GoldenGate installation directory on the source and target systems as well as any working directories that have been installed for a cluster configuration on a shared file system like dirprm,dircrd,dirchk,BR,dirwlt,dirrpt etc. We do not need to backup up the dirdat folder which contain the trail files. 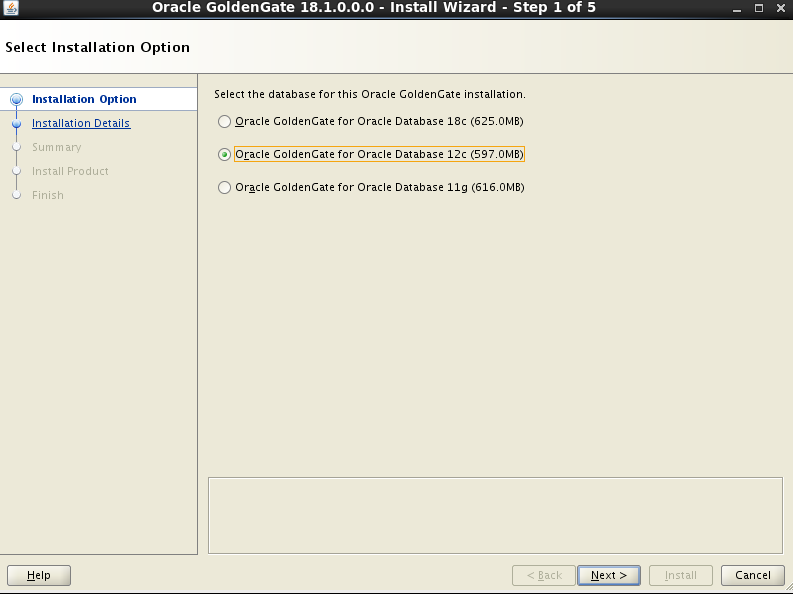 It is recommended to upgrade both the source as well as target Oracle GoldenGate environments at the same time. 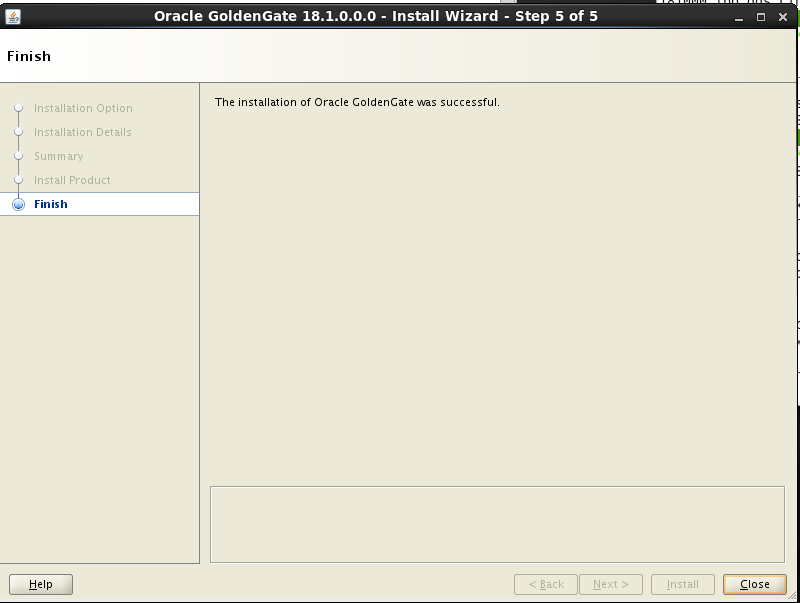 If we are not upgrading Replicat on the target systems at the same time as the source, add the following parameter to the Extract parameter file(s) to specify the version of Oracle GoldenGate that is running on the target. This parameter causes Extract to write a version of the trail that is compatible with the older version of Replicat. 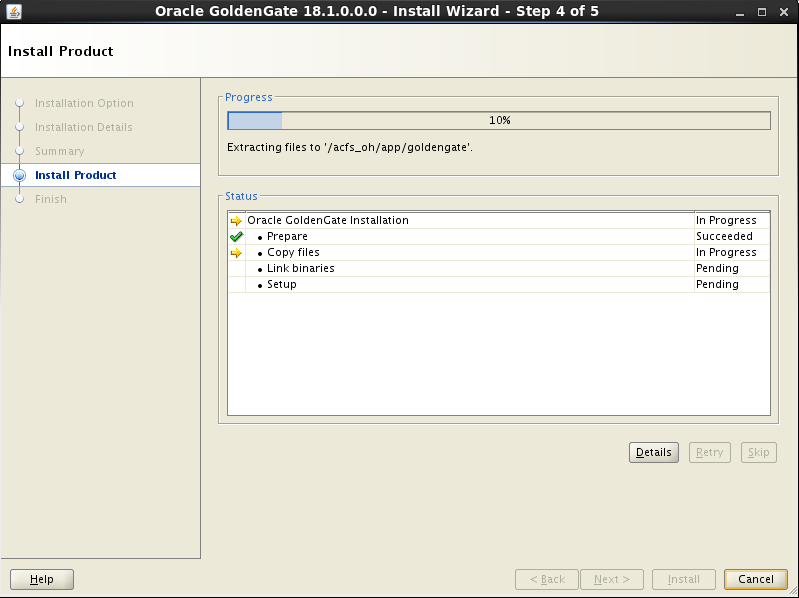 On both source and target Goldengate environments install Oracle GoldenGate 18c (18.1.0) using Oracle Universal Installer (OUI) into an existing Oracle GoldenGate directory. Note: Ensure the checkbox to start the Manager is not ticked. Execute the ulg.sql script located in the GoldenGate software root directory as SYSDBA. This script converts the existing supplemental log groups to the format as required by the new release. Oracle GoldenGate supplemental log groups upgrade script. Please do not execute any DDL while this script is running. Press ENTER to continue. After the installation/upgrade is completed, alter the primary Extract process as well as the associated data pump Extract processes to write to a new trail sequence number via the ETROLLOVER command. Reposition both the existing Extract Pump as well as the Replicat processes to start reading from and processing the new trail file. 2019-01-08 00:44:13  INFO    OGG-01520  Rollover performed. For each affected output trail of Version 10 or higher format, after starting the source extract, issue ALTER EXTSEQNO for that trail's reader (either pump EXTRACT or REPLICAT) to move the reader's scan to the new trail file;  it will not happen automatically. 2019-01-08 00:44:51  INFO    OGG-01520  Rollover performed. For each affected output trail of Version 10 or higher format, after starting the source extract, issue ALTER EXTSEQNO for that trail's reader (either pump EXTRACT or REPLICAT) to move the reader's scan to the new trail file;  it will not happen automatically. 2019-01-08 00:46:08  INFO    OGG-06594  Replicat REP1 has been altered. Even the start up position might be updated, duplicate suppression remains active in next startup. To override duplicate suppression, start REP1 with NOFILTERDUPTRANSACTIONS option. Great Gavin Bhai, well explained. Hi Please always give example of non GUI installation also.